Another command post displacement was indicated for General Saito on 27 June. Mounting pressure against his site in the white cliffs on Tapotchau's east side demanded that the tired old general move farther to the north. His fifth command post was located in a small jungled depression about 2,200 yards north of the summit of Mt. Tapotchau. The cave selected, smallest of all his command posts, served him for two days. Merger of the Central Pacific Fleet Headquarters (Nagumo's command) and the Northern Marianas Group Headquarters (Saito's command) took place on 27 June. Communications between the two had been extremely difficult--sometimes impossible--to maintain, and this move would relieve the problem. The complicated Japanese command structure, with its numerous duplications of responsibility, was difficult even for Japanese commanders to understand; and, with the consolidation of the two in one area, the chances of achieving consistency of orders were improved. The summit of Tapotchau was occupied yesterday evening.1 Front line units tried to retake it with a night attack, but did not succeed as planned. In Donnay the enemy broke through with a number of tanks, but their advance was slow. Thereafter, no great change in the situation. General Saito originated two messages during the day which indicate that he was in a retrospective mood. The essential points of English and American land warfare differ greatly with the common sense considerations of the past. The pressing need of the moment is that the mistake be not made of allowing this important experience in the defense of Saipan to be put to no practical end, and, the soldiers here to be robbed of the fruits of victory after having fought so bravely. The general is not specific on what he considered the departures from the "common sense" tactics of the past, so that it is impossible to pursue this interesting thought to its conclusion. Possibly it is another example of Saito attempting to outguess and anticipate U. S. intentions; and, when that guess turned out to be incorrect, he felt that the Americans were not using "common sense." The practical experiences of the defense forces of Saipan . . . have to do with the power of the enemy naval bombardment. If there just were no naval gunfire, we feel with determination that we could fight it out with the enemy in a decisive battle.
. . . the Banadero airport has not been completed, but in case the necessity arises, it can be used, and the Saipan defense forces trust that they can hold out until the first 10 days of the month (July), awaiting its completion. Because the enemy planes which have appeared in the air are only carrier borne bombers and reconnaissance planes, the situation is such that our large fighter formations could seize good opportunity for daylight sinking of enemy destroyers, etc. Since there is no indication that Saito deliberately attempted to present a false picture, the conclusion is drawn that he was grossly misinformed as to the status of U. S. air at, and around, Saipan, and also as to the willingness and ability of Japanese air to help him. The Japanese escape from Nafutan Point the previous night had caused considerable confusion in rear areas of the 4th Marine Division, particularly in artillery positions of the 14th Marines. Because of the disturbance, the 4th Marine Division received permission from NTLF to delay its appointed attack hour from 0630 to 0730. Progress in the 4th Marine Division zone on 27 June was rapid. The right assault regiment, the 23d Marines, advanced against only scattered small arms fire issuing from the villages of Donnay and Hashigoru. (See Map 18.) Underwater mines, which the Japanese had used as land mines, were found along the road and railroad in the vicinity of Donnay. Tanks detoured these mined areas without difficulty, however. A Japanese supply dump, found near Hashigoru, contained new clothing, ammunition, and infantry weapons. 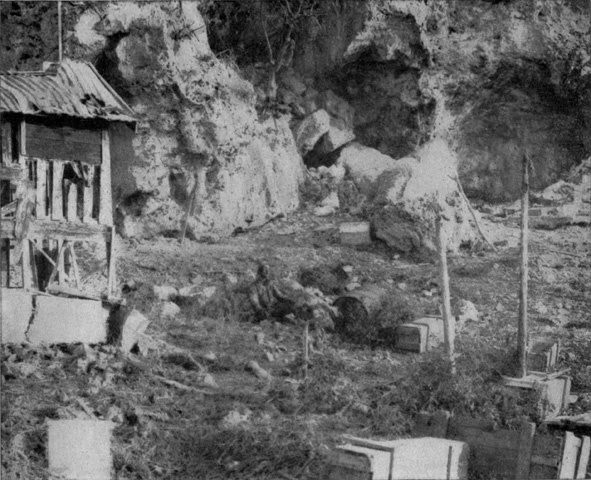 RUGGED CLIFFS, typical of much of Saipan's eastern coast line, provided numerous hiding places for Japanese soldiers. Clearing the enemy from these areas was costly in men and time. Promptly at 0730 the 165th Infantry (less its 2d Battalion, attached to the 106th Infantry) moved out. Formation for the attack was: 3d Battalion on the right (in contact with the 23d Marines) and 1st Battalion, 105th Infantry, (attached to the 165th Infantry) on the left. The reserve of the 165th--the 1st Battalion--would follow the left assault battalion at 600 yards, maintaining contact with the right flank of the 27th Division. The 165th moved rapidly through the hills, particularly in the zone of the right battalion. The left assault unit, weathering occasional squalls of Japanese small-arms fire and traversing rougher terrain, moved somewhat slower. At about 1730, orders came for the 3d Battalion, 24th Marines, to fill the southern portion of the tenuous link between the two divisions. With commitment of this battalion, the schematic appearance of the 4th Marine Division was peculiar (see Map 18), with a front of approximately 2,500 yards and a left flank of about the same length. No sooner had the 3d Battalion, 24th Marines, arrived in position when two enemy medium tanks were sighted to the northwest. Although fired upon by 37mm guns and 81mm mortars, the enemy tanks fired several rounds and escaped unscathed. As already noted, the 27th Division moved but little on 27 June. Colonel Stebbins, the 106th Infantry's new commander, spent the greater portion of the day getting the regiment in position for advances on 28 June. While this resulted in only minor progress, the situation was much improved from the point of view of future action. The most important gain in the 106th Infantry's zone on 27 June was made by the 1st Battalion, on the left. While one company (C) remained in Death Valley to contain the enemy in the cliff by directing fires into the caves from below, the other two companies (A and B) skirted to the west, climbed the southern end of the ridge, and attacked the Japanese positions from above. Since most of the enemy weapons in the cliff face were sited for enfilade fire into the valley, the two companies were able to approach the strong points from the rear. In this manner they avoided the heavy volume of fire that had immobilized movements across the lower ground for so many days. end of the cliff line had been seized, a number of Japanese positions eliminated, and prospects for future advance through the area much improved. One strong point destroyed during the day housed about 20 Japanese soldiers, armed with rifles, machine guns, and three U. S. Browning Automatic Rifles. How they had obtained the latter three weapons was never revealed. Two platoons of medium tanks from the 762d Tank Battalion were attached to the 106th Infantry for the 27 June attack. These platoons were to move out before the infantry assault to neutralize Japanese positions in the cliff line. But plans, unfortunately, went awry. Soon after the tanks moved out on their mission, it began to rain. Dust on the tanks turned to mud, vision from within became blurred, and the machines lost direction. Instead of firing on the planned targets, they opened upon men of the 3d Battalion, 106th Infantry. This miscarriage of plans postponed the attack until 1230, when the 3d Battalion, followed by the 2d Battalion, moved out. Again the enemy in the cliff line opened up, but this time the tanks found their targets and neutralized them. Despite fire from Hill Able to the right front, the 3d Battalion pushed on. By 1342 the unit had reached its objective, a small knoll west of Hill Able, and commenced digging in for the night. When the advance of the 3d Battalion permitted, the 2d Battalion, until then following in reserve, swung to the right and came abreast of the 3d. There it dug in for the night. Company F remained some distance ahead with the 8th Marines atop the cliff. The 106th Infantry had not been sparing in the use of supporting artillery fires. From 25 to 27 June, the following amounts of artillery ammunition had been expended in the regimental zone: 2,606 rounds of light high explosive (105mm); 117 rounds light smoke; 420 rounds medium high explosive (155mm). Only minor advances were made by the 2d Marine Division on 27 June. In the first hour of the attack, the 1st and 3d Battalion, 8th Marines, advanced about 200 yards along Tapotchau's western slopes. Resistance was light, but the terrain again provided the deterrent to rapid movement. At Tapotchau's summit, meanwhile, the 1st Battalion, 29th Marines, completed seizure of the main crest and started the northern descent. The 2d Battalion, 8th Marines, on the division right, conducted aggressive patrolling in the northeast Tapotchau area. Anxious eyes still peered to the right rear in search of elements of the 27th Division, which, as yet, had not moved up on the flank. Though the 1st Battalion, 106th Infantry, had made important gains during the day, the action had been too far to the rear for the Marines to observe. At no time could the 8th Regiment relax attention to the right flank; the enemy capability of clambering up the cliff and striking from the rear was one not to be ignored or forgotten. HIGHWAY, inland Saipan style. Bad as this route appears, it was excellent by comparison with some others that were used. Jeeps carried messengers and supplies forward, evacuated casualties rearward. moved to Colonel Wallace's command post and again reported for duty with that regiment. (It had been attached to the 8th Marines on the previous day but at 1500 had been returned to NTLF control.) Colonel Wallace ordered the unit to relieve the 2d Battalion, 8th Marines, of the flank-watching mission so that the latter could give full attention to the advance. By late afternoon this relief was accomplished, the 2d Battalion, 25th Marines, being deployed in an almost north-south line along the 2d Division's right boundary. At 1700 the battalion made patrol contact with 27th Division troops in Death Valley. Pinch, shift, adjust, consolidate, advance--these were the 27 June plans of the 6th Marines. The 3d Battalion (in the center), tired from days of continuous front line action, was to be pinched out of the front lines and shifted to regimental reserve. The 2d Battalion, on the right, would adjust itself to its new frontage, consolidate its contact with adjacent units, and finally advance. The 1st Battalion would move forward when units to its right had relieved the contact strain. Prior to King-Hour (0630) a small counterattack struck between Companies F and I, 6th Marines. Supported by knee mortars, about one Japanese platoon caused a brief flurry of excitement but little else. The Marines of the two companies converged their fires upon the meager enemy force and quickly repulsed it. Eager to finish a job which they knew was theirs and realizing that the task became no easier with waiting, men of the 2d Marines bided their time along Radio Road outside of Garapan. The wait was not their choice. Nor was it anyone's. To push the regiment--alone--through Garapan would have demanded that its former frontage be assumed by another unit. Since another unit was not available for any such assignment, it remained for the 2d Marines' front to hold and wait until the outer arc of the swing had advanced abreast of it. The seizure of Mt. Tapotchau provided an excellent observation post. From the mountain's towering heights, nearly the entire island could be viewed. To provide security for the 2d Marine Division observation post located there, one company of the 1st Provisional Battalion (formed from Shore Party personnel whose normal function was completed) was detached from the 2d Marines and moved to form a cordon around the installation. Division air observers, operating from the tiny Charan Kanoa strip or from carriers since 15 June, now moved to Aslito Airfield together with their "grasshoppers. "17 The vulnerable, little OY planes proved an extremely valuable means of acquiring enemy information throughout the operation. Last night all fronts were without great change, but since dawn, enemy attacks have grown in intensity, particularly against Tapotchau area and the hill on the northwest side of Chacha, and the hill west of Donnay where the enemy has laid heavy artillery fire. On the south foot of Tapotchau, he seems to have 20 odd mortars, and in the southwest area, over 10 mountain guns and mortars. About 50 men of the 118th Infantry are improving their positions on the east side of Hill 343,23 and one company of the 136th Infantry is improving its position on Hill 268,24 and about 50 men of the 118 Infantry are digging in on the north side of that hill. The main body of the 9th Expeditionary Force, about 200 men, and about 100 men from the 9th Tank Regiment are consolidating their positions north and east of there in the high ground (Chacha water area).25 Though surrounded by the enemy, and receiving artillery fire, we are prepared to make stiff resistance along the cliff line. As the battle progresses numbers of bravely fighting officers and men continue to appear, engaging in hand to hand combat, taking part in raids and scouting missions, and holding back nothing in the service of their Emperor. The fact that Iketa made no mention of defenses west of Tapotchau, in the 2d Marine Division zone, would indicate that he had received no word from either the 135th Infantry Regiment or Navy units located in that area. 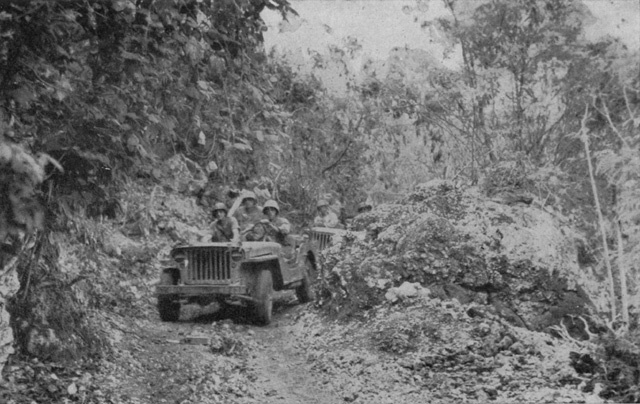 UP-AND-DOWN FIGHTING was necessary to clear Japanese from jumbled maze of coral rock characteristic of inland Saipan. Evacuating wounded from this type of terrain was a major problem. In the 2d Marine Division zone the advance slogged slowly forward. Along the beach the 2d Marines, still unable to advance without breaking contact with units to the east, conducted monotonous patrolling activities into Garapan. In preparation for projected moves through the battered town, artillery, naval gunfire and air strikes pounded targets located there. In one air strike three misdirected rockets fell within the lines of the 1st Battalion, 2d Marines, causing 27 casualties.27 This unfortunate accident occurred when a pilot mistook a puff of white smoke in the Marines' lines for his strike-marker (the target was to be marked with a white phosphorous shell). The length of two football fields or a fairly long golf drive (200 yards) was the average forward movement by the 6th Marines on 28 June. The left assault battalion (the 1st), restricted by the movements of units to its right, could only conduct patrolling operations. In this respect, it was more nearly related to the 2d Marines than to its parent unit. Major Hunt's 2d Battalion continued to fight across the open canefield toward its objective, a low ridge line north of Tipo Pale. 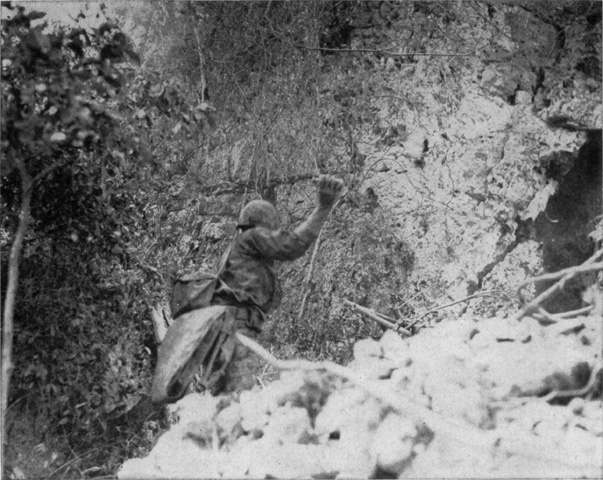 Japanese riflemen and machine gunners, secure in their hillside grotto, raked the clearing with grazing fire. Light flame-thrower and medium tanks were available to the 6th Marines, but their use in this instance was limited because of difficult routes of approach to enemy positions, and support had to be delivered from long ranges. This left the task to the infantrymen. As everywhere demonstrated, reduction of cave positions proved a slow, painful job. By late afternoon the situation had improved slightly and the volume of Japanese fire had diminished somewhat, but the 2d Battalion's unceasing efforts since 0630 found it still short of the ridge line objective and very tired. A great store of energy had been burned in moving across the murderous field, yet more effort would be required. It appeared that the Japanese were rooted to the pock-marked ridge line. Here today, gone tomorrow; that was the rule for the 2d Battalion, 25th Marines. At 0730, 28 June, the organization was again removed from 8th Marines' control and returned to NTLF reserve. After this change, the 2d Battalion, 8th Marines, again assumed responsibility for the division right flank. It was hoped that the advance of the 3d Battalion, 8th Marines, would go forward rapidly since the terrain in this unit's zone afforded satisfactory routes for the forward movement of tanks. Jagged ground in the other battalions' areas was very unsatisfactory for tank traffic. The 2d Battalion, 8th Marines, on the right, was ordered to move out on 28 June in spite of the fact that 27th Division elements had not come abreast. Normal precautions would be taken to prevent the Japanese from exploiting the gap between divisions, but the push to the north would no longer be delayed. Facing the 2d Battalion in its assigned zone was an abrupt drop which virtually prohibited movement to the north. A crevice, not over two feet wide at most points, provided the only route of descent. Movement down this slot as well as the day's advance over a narrow cliffside path demanded that the battalion move in a formation of companies in column and, further, individuals in column of files. Numerous caves had to be investigated as the unit moved parallel to the cliff; but, rather than halting the entire procession while these searches were instituted, small combat patrols were dispatched to do the job while the remainder continued toward Bill's Pimple. single casualty was, in effect, nine men at least temporarily out of action. Sad but true: a man wounded imposed a greater immediate loss on the unit than a man dead. Supply and evacuation in the 2d Battalion's area was improved when a bulldozer carved a lane to the top of the cliff. Although still not satisfactory for vehicular traffic, this route was used to manhandle supplies from the top of the cliff down to the battalion. Since moving into the lines on 23 June, the 27th Division had received mortar and machine-gun fire from the enemy in the cliffs on the left flank. No exception was to be enjoyed on 28 June. Progress, again, was slow. 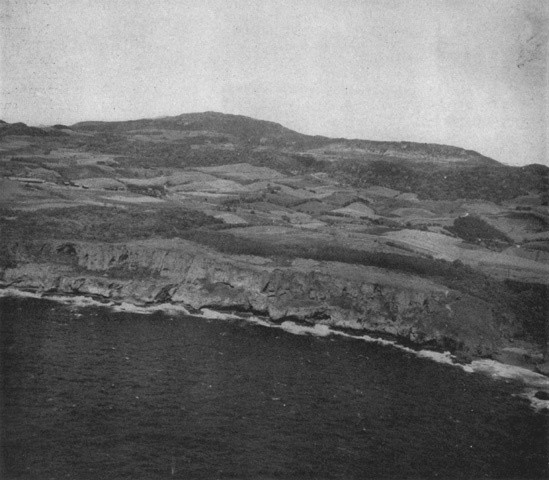 The 1st Battalion, 106th Infantry, which had made some headway against these same cliffs on the previous day, found the craggy precipice dotted with caves. Flushing the Japanese from their hideouts was a lengthy process. Forward gains were short, but a number of enemy installations (housing 12 machine guns and several mortars) were destroyed. FIRE SUPPORT, delivered by a heavy machine gun (foreground) and a 37mm gun (background), assists the infantry advance on enemy positions. Behind the weapon, two crewmen ready additional belts of machinegun ammunition. The 2d Battalion, 165th Infantry, on the division right, meanwhile, continued its assigned task of clearing Hill Able. This was no easy job. On 26 June the battalion commander had reported that his troops occupied the hill, but morning of 27 June found him in error--the Japanese were still firmly in possession. Persistent tenants, they refused to budge despite heavy pressure applied on 27 June. Again on the 28th, repeated efforts were made, but the enemy held. One attempt which appeared to promise certain success inexplicably failed. This attempt had followed receipt of word that U. S. stretcher bearers had moved unmolested along the hill's western base. Maneuvering through the zone already cleared by the 106th, the 2d Battalion, 165th, enveloped Hill Able from the west. Again the attack was repulsed and another failure in the struggle for Hill Able recorded. At 1815 the battalion was detached from the 106th Infantry, with which it had operated for several days, and attached to the 105th Infantry, which was taking over the right of the division zone. Company F, 106th Infantry, meanwhile, moved down from atop the cliff and rejoined its parent battalion. This company had been with the 2d Battalion, 8th Marines, since the evening of 23 June. The Marines were sorry to see the unit leave. During its week atop the cliff Company F had proved itself an aggressive, well-led organization. "Hold Present Positions. . . . "
In compliance with that part of the order which directed that fire assistance be provided the 27th Division, General Schmidt ordered the 165th Infantry (less 2d Battalion) and the 24th Marines to establish one battalion each along the division boundary. The 1st Battalion, 165th Infantry, and the 3d Battalion, 24th Marines, found the extension too great for them to cover. Even with the commitment of another battalion from the 24th Marines (the 1st) and readjustment of the 1st Battalion, 105th Infantry's lines, physical contact still did not exist with the 27th Division. Four battalions attempted to cover the open flank, while only three faced the front. The enemy is steadily increasing his troop strength opposing our front lines in hill lines west of Donnay and is closing in on our positions; a few of the enemy have infiltrated into our positions. The enemy is still not north of Donnay. A correction could have been added by the men of the 4th Marine Division: "We are already north of Donnay." With the operation two weeks old, everyone on the island felt the weight of fatigue settling down. Like a runner waiting for his "second wind" the three U. S. divisions limped sluggishly at their tasks. To prevent this weariness from turning to apathy, the need for outstanding leadership became more pressing. Everyone is an all-embracing word. Everyone was tired. For while the U. S. troops had endured much at Saipan, the Japanese had suffered more. It was effort expended positively against effort spent negatively, and the latter was more depressing. Then, too, it was easier to fight forward than backward. Apart from the psychological implications, however, the Japanese had suffered more from U. S. supporting arms. This was material, this produced casualties, and even the best calculated propaganda could not erase its effects. Despite the difficulties and confusion imposed by U. S. bombardment, Major General Iketa found time to answer a message from the Tinian Defense Force (50th Infantry) on 29 June. Still hopeful of receiving reinforcements from Tinian, Iketa admitted that the waters around Saipan were strongly patrolled by U. S. vessels, but "it is probably possible for small boat operations to break through Tinian channel at night and follow along the east coast and enter at Hanachiru." The uncertainty displayed by his use of the word probably is repeated in the concluding sentence: "The objective after landing will probably be in vicinity of wireless station. "47 From the volume of correspondence that had been exchanged on this subject, the impression is derived that the Tinian commander was not anxious to undertake these moves and was stalling for time. Then too, there is the possibility that those few miles of American-patrolled water separating him from his Saipan superiors had convinced the Tinian commander that he should do his own thinking. In any case, it is small wonder if he quailed at the prospect. Since 27 June, when it had advanced 3,000 yards in a rapid sweep, the 4th Marine Division had been restricted to only consolidation and readjustment of its lines. Further advance would merely accentuate an already acute contact problem, inasmuch as the 27th Division was still a long distance behind. The 1st and 3d Battalions, 24th Marines, remained along the 4th Division left boundary, though they had been unable to stretch far enough to contact the 27th Division. Daylight of 29 June revealed that a number of Japanese had filtered through the gap between divisions. Once behind the 4th Division's lines, these infiltrators began an energetic program of harassment. Positive action was demanded, and the 2d Battalion, 24th Marines, in division reserve, set about the elimination of the hostile groups. Company G, 24th Marines, remained at Kagman Peninsula, executing a coastal observation mission. 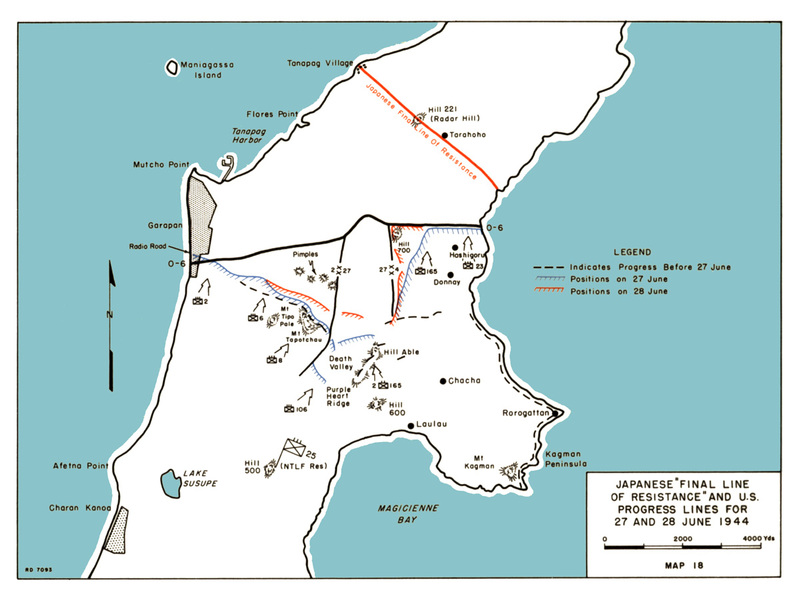 The 24th Marines' situation remained generally unchanged until about 1700, 30 June, when the 1st Battalion was pinched out by a shortening of the vertical connection as the 27th Division moved forward. D-plus-thirteen (28 June). Regiment continued assignment in NTLF reserve. D-plus-fourteen (29 June). Same as D-plus-thirteen. If the action for this period was as dull as the report, that was completely to everyone's liking. Certainly the 25th Marines had been in the thick of the fight earlier in the operation, and there was no reason to suspect that they still would not be in for more. After days of virtual stalemate, the 27th Division's advances on the last two days of June were indeed gratifying. Lieutenant Colonel Bradt's 3d Battalion, 105th Infantry, ordered from division reserve into the lines on the right of the division front, arrived at the line of departure and attacked at 1100, 29 June. Rapid progress by this unit reduced the size of the vertical gap on the 27th Division's right flank by about 800 yards. On 30 June, after another sizeable surge, good contact was established with the 24th Marines. This advance cut the reentrant depth to about 1,200 yards. Men of the 2d Battalion, 165th Infantry (now attached to the 105th Infantry), continued their battle of previous days to oust the persistent foe from Hill Able. This feature, erroneously reported captured on 26 June, demanded the unit's full effort and attention until 30 June, when it was finally secured. On the left of the division's front, the 106th Infantry continued its difficult move past the cliffs. Lieutenant Colonel Cornett's 1st Battalion, which had spent the two previous days in cliff-cleaning operations, moved back into Death Valley and relieved the decimated 3d Battalion on the regiment's left. But in all other respects the situation was unchanged. On 29 June, the regiment's advances were small, being principally hampered by a stuttering machine gun on its right flank and by several stationary, camouflaged tanks to the front. Difficult to locate, these tanks made movement through the area costly. By 30 June, however, the volume of fire had diminished and the two units moved rapidly. Physical contact finally existed with the 8th Marines on the left. Contact between adjacent divisions, regiments and battalions will be maintained at all cost. A continuation of the highest standards of personal leadership on the part of all officers is expected. The left flank regiment of the 2d Division, the 2d Marines, had had an opportunity to try a number of patrolling techniques during its long wait at Garapan's southern edge. Large patrols, small patrols, combat patrols, reconnaissance patrols; all proved invaluable both for the information they brought back and for the continuous state of unbalance their activities imposed upon the Japanese. On 29 June the Marines successfully employed an unusual stratagem. On a knobby hill 500 yards forward of the 2d Marines' Radio Road positions, about a platoon of Japanese were well dug-in. This hill, named "Flametree Hill" for the effusive cluster of reddish-orange trees there, formed a tiny oasis in a desert of battered ruins. Once a shrine park, it still contained an austere statue of some long-forgotten Japanese statesman. During daylight hours, the bulk of the enemy on Flametree Hill remained in caves, with only a few occupying positions in the open. The latter were for the obvious purpose of watching the Marines and alerting their comrades in the caves of an impending attack. By this means, the greater part of the defenders were protected from the shower of supporting fires while at the same time they were in proximity to their defense positions should the 2d Marines begin the long-awaited attack. Even though the size of the enemy force was not great, the excellent observation afforded by the hill would allow the Japanese to play havoc with an organized attack toward Garapan. The Marines' problem, then, was to get the sheltered Japanese into the open so that the supporting fires could impose casualties. To do this, a dummy attack was executed on the morning of 29 June. Commencing at daylight a thunder of high explosive and white phosphorous shells from artillery, 81mm and 60mm mortars enveloped the hill--the high explosive to confuse the enemy into thinking that the fires were in preparation for an attack, the white phosphorous to deny them observation. Simultaneously, six .30-caliber heavy machine guns explored the hill with searching and traversing fires. again. Previously, the artillery had used high explosive ammunition against the hill; now, with the enemy exposed, airburst shells were employed. Flametree Hill seemed to erupt and split apart under the concentrated shelling. In the center of the 2d Division zone the 6th Marines moved but little on 29 and 30 June. Lieutenant Colonel Jones' 1st Battalion, on the left, was still in the same situation as on previous days. Like the 2d Marines, Jones' unit could not move forward until the dominating terrain on the right had been seized, or more specifically, until other units had come abreast. The time was, therefore, spent in patrolling of the area to the front and such minor adjustment in the lines as could be undertaken without breaking contact. The right of the regiment's zone was, and had been, the scene of the most trouble. The 2d Battalion had punched at the ridge north of Tipo Pale for two days, and though it had not carried the objective, it made a substantial improvement, principally in the destruction of several enemy weapons. But the unit was tired. The fight had not been cheap. Colonel Riseley decided to pass the 3d Battalion through the 2d for the continuation of the attack. The shift was accomplished by about noon. The 3d Battalion, however, met the same determined, if slightly weaker, foe that had battled the 2d to a virtual standstill. By dint of great effort, the 3d Battalion was able, at 1630, to seize a toehold which presented a favorable forecast56 of the next day's events. The four Pimples on Tapotchau's northern face made convenient targets for the fires supporting the 8th Marines, as well as providing excellent objectives for the battalions. But a locality worth attacking is also apt to be an area worth defending. The enemy occupied the Pimples, during the last days of June, in sufficient strength to make it a fight. No one had reason to believe that the Japanese would withdraw without a fierce struggle. bring tanks into the fight. The possibility of moving the machines through the 27th Division's zone to the support of the 8th Marines appeared impracticable because of the time element. Then too, it was hoped that patrols would discover a more convenient route momentarily. None was found on 29 June, but the following afternoon a short advance by the 3d Battalion uncovered a route which, after improvement by bulldozers, served the purpose. Company A, 2d Tank Battalion, then proceeded to an assembly area in rear of the 8th Marines' lines in preparation for the attack of 1 July. The two battalions occupying the right half of the regiment's front (1st Battalion, 29th Marines, and 2d Battalion, 8th Marines), fighting through similar terrain near the division's right boundary, found it imperative to coordinate their efforts carefully. Likewise, the two left battalions of the 8th Marines (3d and 1st), because of kindred terrain problems, assumed a closely-knit harmony of plan and action. Colonel Wallace, the regimental commander, quickly recognized the close integration of these groups and encouraged this attitude. Thus, Wallace was somewhat eased of the burden of coordinating the efforts of four assault battalions and was accorded a greater freedom of decision. The most significant move by the 8th Marines during the last two days in June was the seizure of Bill's Pimple, on the division right flank. (See Map 19.) This hill, so tough to take had the Japanese chosen to make it so, was seized by the 2d Battalion on the late afternoon of 30 June without a serious fight. Immediately after the capture and as a result of an earlier request by the 8th Marines, a medium tank platoon of the Army's 762d Tank Battalion arrived on Bill's Pimple to render fire support. Since the 2d Battalion contemplated no further moves that day, the tanks were employed against Tommy's Pimple to the west. The latter feature had defied capture on 30 June, all attempts by the 1st Battalion, 29th Marines, to advance against it being stopped. The 2d Battalion's advance, plus the availability of more supporting weapons (chiefly tanks), made prospects for 1 July good, however. The 8th Marines' picture had clarified and improved in several respects by the evening of 30 June: tanks were at last in supporting positions; all battalions, except the 1st Battalion, 29th Marines, now had one company in reserve; all, save the 2d Battalion, were now supplied by truck, the open right flank was no longer such a worry: a company of the Provisional Battalion had moved in behind the 2d Battalion, and patrols from the Army's 106th Infantry now operated in the gap between divisions. ROCKET BARRAGE in the making. 4.2-inch rocket trucks were effectively employed by the 8th Marines north of Mt. Tapotchau and later by the 23d Marines at "4th of July Hill." Night activity had seemingly slackened; the night of 29 and 30 June remained reasonably quiet in all zones. Individual instances of sniping and infiltration were so commonplace by this time that they often were not even reported. 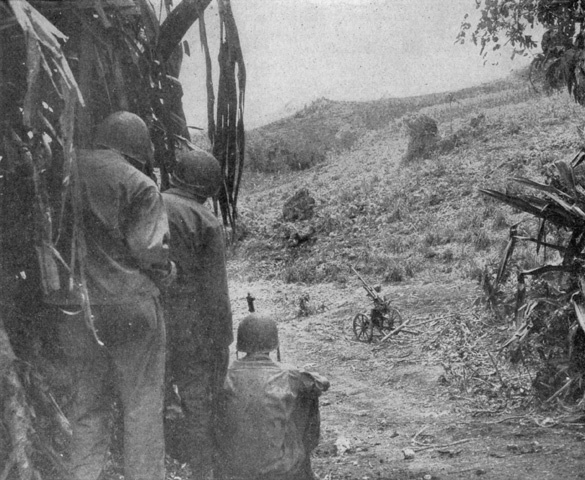 BAZOOKAMAN (at left) and assistant cautiously search for targets at Garapan's outskirts. After a long wait for units on the right to come abreast, the 2d Marines finally advanced into Garapan on 2 July. The reason for the enemy's general retirement was the desire of General Saito to pull back and shorten his line, regroup his forces, and coordinate the defense. With his command scattered through the roughest terrain, at the island's widest point, he had been unable even to disseminate his orders in time for integrated action. He hoped that the withdrawal would improve the situation and that he could then conduct the type of mobile defense in which he believed. The Northern Troops and Landing Force achieved important gains on the first two days in July. The swing to Tanapag began in earnest. Reports of the general Japanese retreat had begun arriving at the NTLF command post on the previous night, and with the coming of daylight on 1 July, the reports continued. Along a road to the front of the 27th Division, the enemy could be observed pulling back to the north. They were on the run but still capable of turning around and making it a fight. There was plenty of venom left. SUGARLOAF HILL dominated Garapan and surrounding coastal plain. 1st Battalion, 2d Marines, skirted these sheer south and west slopes and seized this feature from the east on 2 July. Along the beach Colonel Stuart's 2d Marines spent 1 July in routine patrolling, but on 2 July began the long-delayed movement through Garapan. Attacking with the 1st and 3d Battalions abreast, 1st on the right and the 3d Battalion, 8th Marines, in reserve, Stuart's men made excellent progress. The days and weeks of pounding paid dividends. Supported by Company C, 2d Tank Battalion, the 3d Battalion65 swept through the rubble-strewn flatlands at a steady pace. Encountering rifle and machine-gun fire, men of the battalion took grateful advantage of the protection afforded by the torn hunks of concrete littering the area. 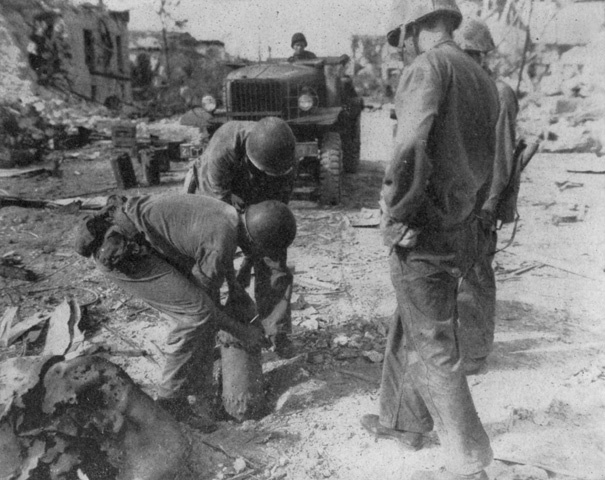 With tanks ricocheting rounds among the shattered ruins, the Marines moved into the very heart of what had once been Saipan's largest town. (LVT(A)'s of the 2d Armored Amphibian Battalion provided close fire support against targets near the beach. into positions from which to bring their shattering fire power to bear. Within two hours after the jump-off, Company A had enveloped Flametree Hill from the west, fighting a lively skirmish with a detachment of cave-dwellers there. Then the battalion moved to the north towards the day's objective, a dominating eminence about 1,000 yards inland from Garapan's center. This feature, an expansive knob with forested slopes, had been named "Sugarloaf Hill" by the 2d Marines. Approached from north, south, or west, this feature presented steep, challenging slopes. From the east (inland) flank, however, the rise was very gradual and Kyle selected this approach. Against fairly heavy machine-gun fire, the battalion swept to the top of the hill, mopped-up the Japanese defenders and by 1700 established contact with the 6th Marines on the right. As had been the case on so many previous days, the right half of the 6th Marines front gave the most trouble on 1 and 2 July. Emplaced in a ravine 500 yards forward of the 3d Battalion's lines were three Japanese field pieces protected by a host of rifles and machine guns. As the Marines attacked toward this area on 1 July, rifles and machine guns stuttered inhospitably, while the field pieces punctuated the threat with frequent rocking blasts. The 3d Battalion achieved little toward the destruction of this enemy stronghold during 1 July; but, with the support of tanks, 37mm guns and 75mm half-tracks, the unit finally moved to commanding ground facing the ravine. The 1st Battalion, meanwhile, restricted its advance to conform to the slower movement of the 3d Battalion. Light resistance on its front made rapid strides possible, but the difficulties of maintaining contact deterred Colonel Riseley from ordering the unit to push on. 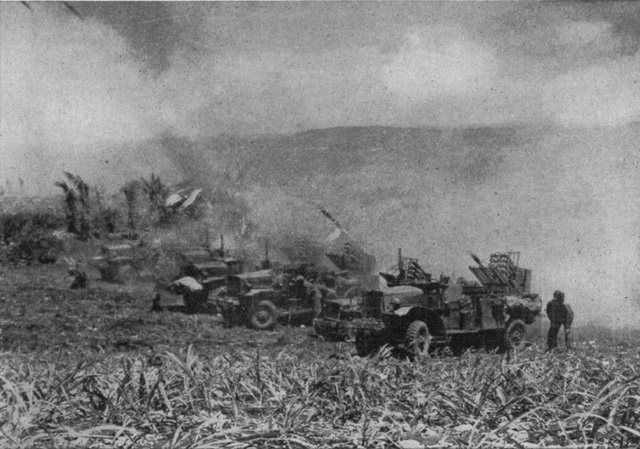 More open terrain, or an enemy less adept in infiltration, may have justified long thrusts by a single unit; but neither of these situations prevailed at Saipan. By dark of 1 July, when it was apparent that the ravine strong point would not be reduced, the 1st Battalion pulled back a short distance to achieve better contact. The 6th Marines were old hands at dealing with troublesome cores: experience had been a stern teacher in the north Tipo Pale strong point. Without hesitation, unit commanders applied the tactics that had worked previously; Company B remained behind to contain and destroy while the rest by-passed the area and continued the attack. Once past this "loaded" draw, both battalions swept rapidly forward. By nightfall of 2 July the Japanese had lost another 700 to 1,200 yards, the greatest gains having been made on the left and center. Just before dark the 6th Marines lost a jeep and a half-track when these vehicles ran over land mines which the Japanese had strewn haphazardly through the area. 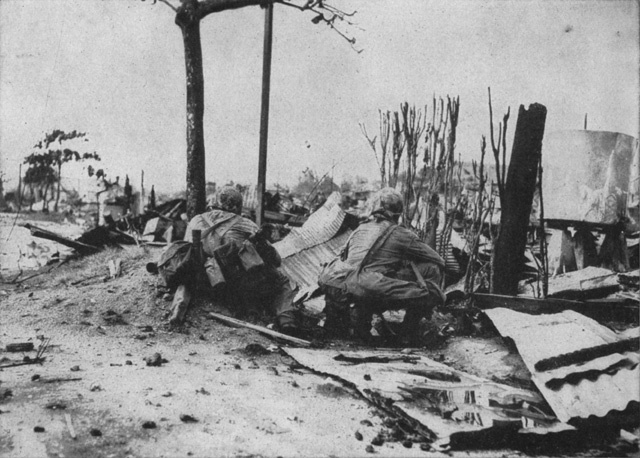 Although still broken and heavily wooded in spots, the terrain facing the 8th Marines was the most favorable that the regiment had seen for many days. Tanks, which had found Tapotchau terrain awkward, could now move with dispatch, thus speeding the infantry's advances. This factor, coupled with the enemy's withdrawal, permitted the 8th Marines to sweep ahead nearly a mile on 1 and 2 July. And the welcome sight of the water at Tanapag spurred the efforts even further. A well-executed tank-infantry thrust on the morning of 1 July carried the 1st Battalion, 29th Marines, to the top of Tommy's Pimple without a fight. Then, in conjunction with the 2d Battalion, 8th Marines, the attack continued. The two battalions now faced a series of relatively open ridges leading down to the coastal flats in the Tanapag vicinity. The exceptionally good observation facilities were used to advantage in bringing rocket and artillery fire to bear on any areas that appeared to offer positions for the enemy. As the 2d Battalion, 8th Marines, pushed its attack across an open field on the afternoon of 2 July, a small coral limestone hill on the right flank suddenly came alive. Grazing fire swept the open field, stopping the Marines' forward movement. 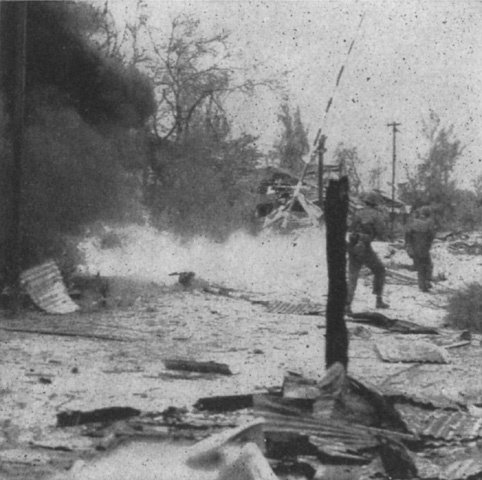 The 1st Battalion, 29th Marines, also exposed to some of this fire, was slowed to a virtual standstill. During the afternoon this unit suffered the loss of another battalion commander; Lieutenant Colonel Tompkins fell wounded from a shell fragment. The 8th Marines' executive officer, Lieutenant Colonel Jack P. Juhan, immediately assumed command. The 2d Battalion, meanwhile, developed a stubborn, unseen foe of undetermined strength in the limestone hill. Hidden in the hummock's crevasses and caves the enemy brought accurate small-arms fire to bear upon the Marines. The word "accurate" is not used loosely here; few rounds were wasted. The battalion and Company G had a joint observation post located in a small island of trees in the center of the field. Each time a messenger attempted to run across the open field and enter the wooded clump, it was a dash through a gantlet of lead. Often as not, the messenger could not make the race to and from the observation post without getting hit. For this reason, this means of communication was not used except in cases of great emergency. Major Chamberlin, commanding the 2d Battalion, tried to envelop the point of resistance, using Company F in a swing to the east. But the Japanese had not ignored this route of entry into their position and met Company F with a prohibitory fusillade. In addition, the Marines' envelopment route (the only one available) was through intertwining, snare-like underbrush, through which it was virtually impossible to move. By dark, all wounded had been rescued, but the task of seizing the hill still remained. Captain Edward L. Bale, Jr., commanding Company A, 2d Tank Battalion, came up at this juncture with a suggestion both unique and resourceful. He proposed a night tank raid against the hill using illuminating shells and medium tank spotlights to brighten the area while light flame-thrower tanks (which had just arrived for the night mission) moved in close for the roast. The bizarre plan had one routine feature: riflemen and machine gunners of the 2d Battalion would watch the hill and shoot any Japanese attempting to dash from cover to place magnetic mines against the tanks. SURRENDER? 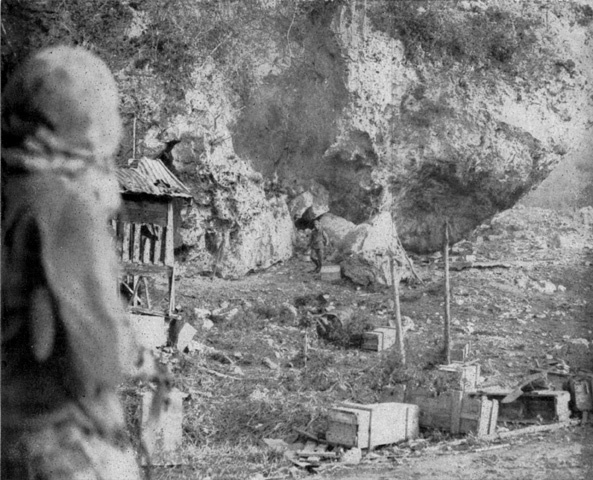 Japanese soldier stumbles dazedly from a cave following a shattering explosion at the cave entrance. Marine at left watches, rifle ready. About an hour after dark the raid was launched. As planned, the area was bathed in a lucid, bright light as the little tanks lumbered toward the hill on their mission. Once there, they spat at the hill with long streams of flame. Men of the 2d Battalion, 8th Marines, with weapons at the ready, watched the arson with keen delight. After completing the searing process and discharging their flamethrower fuel, the tanks returned to the lines. No one ventured upon the smoldering hill to inspect the results, but all felt that some good had been accomplished. The two left battalions of the regiment (2/2 and 1/8), meanwhile, seized their Pimples on 1 July and pushed on to the north. Nutting's 2d Battalion, 2d Marines, which had exchanged jobs with the 3d Battalion, 8th Marines, on the morning of 1 July, quickly adjusted itself to the new surroundings and drove forward. Coral limestone cliffs, similar to those troubling Chamberlin's battalion, caused some difficulty, however. Japanese holed up in these formations invariably fought until they had either been killed or their cave positions sealed. Whether these Japanese represented that inevitable percentage that never gets the word (to withdraw in this case) or whether they were carrying out a delaying mission was never determined. STILL FIGHTING, although covered at point-blank range, this Japanese attempted to throw an explosive charge, but alert Marines (see picture opposite page), well familiar with such tactics, were quick to shoot him before he could pull the pin. 2 July. Progress by the 8th Marines, therefore, caused a break to develop. To fill this area the 1st Battalion, 8th Marines, committed its reserve company. Just as the latter battalion prepared to halt for the night of 1-2 July, 30 Japanese, operating in the best traditions of a race that believed in death lunges, charged the Marines. Outnumbered and outgunned, the Japanese fell before the fence of bullets thrown out by the men of the 1st Battalion. attachments, and attachments within attachments, only the 106th Infantry remained intact. The other two infantry battalions under 27th Division control were the 3d Battalion, 105th Infantry, and the 2d Battalion, 165th Infantry, both operating under Colonel Bishop, the 105th's Commander. Though General Griner's field order for 1 July gave missions to two regiments, the total assault battalions were only three: 1st and 2d Battalions, 106th Infantry, and the 3d Battalion, 105th. Manning the left and center of the division's front, Colonel Stebbins' 106th Infantry moved 2,700 yards forward on 1 and 2 July against sporadic rifle, machine-gun and mortar fire, and occasional shelling from hostile artillery--nothing to compare with that experienced in earlier days of the Death Valley fight. Encountered and destroyed on 2 July were five Japanese tanks (emplaced as pillboxes) and numerous ammunition dumps. In connection with the capture or destruction of Japanese ammunition was the unescapably cheerful feeling that every round not in Japanese possession was a round that would never be fired at U. S. forces. The 105th Infantry, attacking with its 3d Battalion in the assault and the 2d Battalion, 165th, in reserve, met its principal difficulties from Japanese flanking fire which issued from hillside caves in the regiment's zone. Here the story was an old one: the enemy, hidden in the deep shadows of natural caverns, funneled fire on their attackers. The tactic was as familiar and predictable as were the caves which abound on the island. And yet, the task of eliminating these holed-up individuals became only slightly easier with practice. (This schooling had too few live graduates). Locating these cavemen was difficult since it was usually necessary that they break silence and fire at least one round. That first round was apt to come from close by and would very often claim a casualty. With luck, then, the lair might be discovered with only a single loss. The hazardous task of sealing the cave, once located, required placement of the explosive in the cave entrance. This type of fighting was the work of individuals or small groups rather than units; and, while they executed their heroic tasks, the rest could only watch and wait and provide what fire assistance was possible. No wonder, then, that the 3d Battalion, 105th, could gain but 300 yards on 1 July. And this much yardage was possible only because one hill strong point was by-passed during the morning, the 3d Battalion leaving one company behind to contain and destroy it. Later in the afternoon, elimination of this enemy pocket became the task of the 1st Battalion, 105th Infantry, which had reverted from its attachment to the 4th Marine Division at 0900, 1 July. This unit arrived in the 105th Infantry's zone in time to take over and complete the mopping-up mission. The other battalion of the 105th (2d) was still operating in the Nafutan Point area under Saipan Garrison Force control. The 2d Battalion, 165th Infantry, separated from its parent regiment since 26 June, was ordered into NTLF reserve on the evening of 1 July, though it would remain in 27th Division rear areas. This assignment did not relieve the present reserve (25th Marines), but, rather, augmented it. the speed of flank units could not be duplicated. By dark, therefore, both flanks were uncovered and the unit still faced the Japanese strong point. The 165th Infantry (less the 2d Battalion) had been waiting, as part of the 4th Marine Division, for the 27th Division to come abreast. This delay followed the 4th Division's rapid 27 June advance which left the 27th Division a considerable distance behind. To allow the latter time to knock out the resistance holding it up and to catch up, the 4th Division had restricted its activities to patrolling, minor adjustment of its lines, and fire assistance to the 27th Division. With the return, on the morning of 1 July, of the 1st Battalion, 105th Infantry, to the 27th Division, only two Army battalions remained under 4th Division control. And even their period of attachment was rapidly drawing to a close. An NTLF order directed the 165th to revert to 27th Division control at 0530, 2 July. Actually, this reversion had no effect on the unit's position on the front lines; it rather marked the termination of the period in which it was more convenient to have it attached to the 4th Division than to the 27th. Advances by the latter now warranted the return of the regiment to its normal command. Along the east coast the 23d Marines continued vigorous patrolling of the area to the front. Though penetrating enemy territory to a distance of 1,500 yards on 1 July, patrols made no contacts. For the attack of 2 July the 3d Battalion, 25th Marines, returned to the 4th Division. The rest of the 25th Marines, however, remained in NTLF reserve, an assignment first received on 23 June. assault battalion (the 1st) experienced no difficulty whatsoever. Like the 165th Infantry, the 4th Division had pushed so far ahead of the 105th Infantry that further moves would present serious problems of contact. For this reason, the division was ordered to stop and dig in. Owing to the uncertainties of the left flank, the 3d Battalion, 24th Marines, was placed along the division boundary facing to the west, prepared to counter any Japanese threat from that direction. General Holland Smith agreed with Harper's opinions and immediately sent a dispatch to all units directing that massed artillery be more extensively employed. While this represented neither new doctrine nor new policy, it came as a timely reminder to those units which had become overly sparing in the use of this valuable arm.
. . . I immediately notified Headquarters NTLF (C/S Brig. Gen. Erskine) that, while I fully appreciated the value of and wanted to use massed artillery fires, wherever practicable, the artillery ammunition levels in the division dumps had never, since D-Day, been high enough to permit extensive use of this type of fire by Division artillery. He replied that sufficient ammunition would be made available. On the morning of 2 July I directed an artillery preparation be fired along the division front. This preparation lasted only for a few minutes. Yet by mid-morning the expenditure of ammunition occasioned by this preparation coupled with the normal fires of the day caused NTLF to notify the Division that it would be impossible to provide sufficient ammunition to maintain minimum artillery dump levels for massed fires. Massed fires would therefore have to be restricted accordingly. There was very little enemy activity during the nights of 1-2 July and 2-3 July. Apparently, the withdrawal had temporarily ruled out the possibility of counterattack by more than token forces. But no one slept well. There was just enough activity to maintain a state of perpetual tenseness. Relaxed slumber would have to wait. the night of the 1st the 6th Marines captured 70 civilians and three Japanese military personnel through voluntary surrender. Later, a single Japanese attempting to move through the lines and return to his own unit met a quick fate. The same night, men of the 8th Marines spotted 15 prowlers along their front and killed them all. When the excitement from this diversion subsided, three Japanese soldiers carrying land mines were killed as they tried to move through the lines. The 1st Battalion, 29th Marines, intercepted and killed three would-be infiltrators. The 27th Division experienced sporadic, random firing all along its front and achieved the satisfaction of killing five Japanese by means of booby traps set by the 165th Infantry. In the 4th Marine Division it was even quieter. Only one instance of hostile mortar fire, which fell on the division command post, was reported. The night of 2 July was similar. Japanese patrols continuously sneaked along the 2d Marines' front. Of three Japanese endeavoring to rove through the 6th Marines' lines, one was killed and the other two routed. Achieving the distinction of doing the unusual and unexpected during the evening, a Japanese soldier strode into the 6th Marines command post and signified his desire to surrender. This he was allowed to do. The 106th Infantry reported that the enemy was firing flares intermittently from 2100 to 2400. This served to alert personnel to the possibility of a coordinated attack, but none developed. A number of violent exchanges between the soldiers of the 27th Division and lurking Japanese occurred throughout the night, but there was no indication that this enemy activity was intended as a major thrust. In the morning when a count was possible, the 105th Infantry found 27 Japanese bodies, while the 106th and 165th Infantry Regiments counted 10 and 18, respectively. When the results of these night excursions are balanced against the damage these same Japanese might have accomplished had they remained in caves, the futility of these moves is clearly revealed. The meager strength of enemy air over Saipan could give the beleagured Japanese troops little comfort. The attacks were a nuisance to U. S. ships and installations, little more. Japanese planes did not raid Saipan again until 5 July. STREET FIGHTING, the first experienced by Marines in World War II, was hot and heavy in Garapan. A flame-thrower is used here to roast an enemy hideout in the rubble. For the victor, the engagement can never be decided too quickly; for the vanquished, it can never last too long. The speedy victory is a higher degree of victory; a late decision is on the side of the defeated some compensation for the loss. Holland Smith wanted Saito to get as little "compensation for the loss" as possible. For the 2d Marine Division the objective for 3 July was O-7, which included the town of Garapan and the seaplane base at Tanapag Harbor. With half of shattered Garapan behind it, Colonel Stuart's 2d Regiment readied itself to complete seizure of the town and Mutcho Point, jutting from Garapan's northwestern outskirts. Duty in the town had little to commend it; battered skeletons of what had once been buildings, and humans, and animals, dotted the area; the choking smell of death hung about like a fog. And everywhere were the pieces of corrugated iron which the Japanese and natives had used as roofing for almost every structure from the hen house to the bank. To step on one of these huge rattling sheets was to inform everyone thereabouts of one's presence.82 Garapan's trash and garbage dump appearance was further enhanced by odd clothing, shoes, papers, books, and miscellaneous bric-a-brac strewn through the area. Perhaps the only bright point was the copious wells, providing adequate water for the 2d Marines to bathe away some of the filth on their bodies. 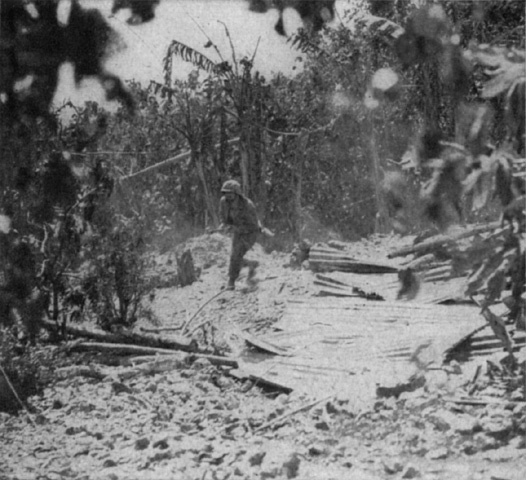 Dodging their way through the rubble, men of the 2d Marines made good progress: by noon of 3 July, despite abortive efforts of a few Japanese who determined to make a street fight of it, the 3d Battalion (on the left) had swept nearly 700 yards. In the center of the regiment's zone, several pillboxes were encountered, slowing movement there but allowing both flanks to advance. Light flame-thrower tanks and medium tanks seared and plastered the front of the pillboxes, while assault engineer teams, covered by riflemen and machine gunners, moved to the flanks or rear and placed their shattering explosives. Thus, the enemy positions were systematically reduced. AERIAL BOMBS were extensively employed as land mines by the Japanese. Buried with noses protruding above ground, the bombs could be set off by almost any United States vehicle. This 123-pound bomb was found in Garapan. The 1st Battalion, meanwhile, advanced through the foothills on Garapan's eastern environs. Progress until noon was not great (400 yards), but in the early afternoon the unit began to gain momentum. By 1800 it had pushed to O-7, at that point on the water's edge north of the town. This speedy thrust cut off the Japanese remaining in the Garapan vicinity. THE BATTLE WAS INTIMATE, lonely and personal, even though thousands of troops were present. Here a single Marine advances "on the double" near Tanapag Harbor. streets, it swung out upon Mutcho Point, a movement chiefly complicated by annoying air bursts from a Japanese heavy antiaircraft gun in position north of Tanapag. By about dusk the advance halted for the night with only 400 yards of the point unconquered. The noose was tight and the Japanese who had retreated to the tip of the point were neatly trapped. The 4th of July was almost a holiday for the 2d Marines. The 3d Battalion quickly mopped up the unfortunates on the point and established a coast line defense of the Mutcho Point-Garapan area. Remaining to be captured by the 1st Battalion was the boat basin which appears to hang suspended into Tanapag Harbor (see Map 20). Only one dryland approach existed: over the open, concrete ramp from the shore. Since troops moving upon this would be extremely vulnerable to grazing fires from any point in the boat basin or in the breakwater that surrounded it, the battalion commander decided to execute the move in amphibian tractors, landing at the end of the basin. Fire support would be furnished by the LVT(A)'s of the 2d Armored Amphibian Battalion. This landing was complicated by communications failures between the amphibians and the troop commander but, nonetheless, was successful. Only a few Japanese were in the basin and these were incapable of more than token resistance. Only one Marine was wounded. In a repetition of so many previous days, the 6th Marines moved faster on the left than on the right, where the Japanese had exploited the defensible terrain. Keeping pace and acting in concert with the 2d Marines on 3 July, the 1st Battalion swung its left flank to the beach (O-7) while its right was echeloned far to the rear to contact the 3d Battalion. The latter unit moved rapidly at first; but, as the Marines approached the last high ground overlooking Tanapag Harbor, a heavy volume of Japanese rifle and machine-gun fire bid them unwelcome. By now the procedure at such times was clear: blast the area with all available supporting weapons, establish fire superiority, move in for the kill. By late afternoon the 3d Battalion seized the commanding ground; but, inasmuch as a distance of 1,000 yards still remained before the coast could be reached, Colonel Riseley ordered the unit to hold for the night. Although contact between the two battalions of the 6th Marines was tenuous, nothing save desultory rifle fire occurred during the night. The activities of 4 July resembled a mop-up more than an attack. By shortly after noon the 3d Battalion had completed the descent from the high ground, moved across the Tanapag flats, and joined the 1st Battalion on the beach. (See Map 20.) Then began the routine task of clearing the omnipresent snipers from the area. TRAPPED JAPANESE, north of Garapan, attempted to gain refuge during the first days in July by getting to their sunken ships in Tanapag Harbor. Artillery and naval gunfire made quick work of the hulks, however. 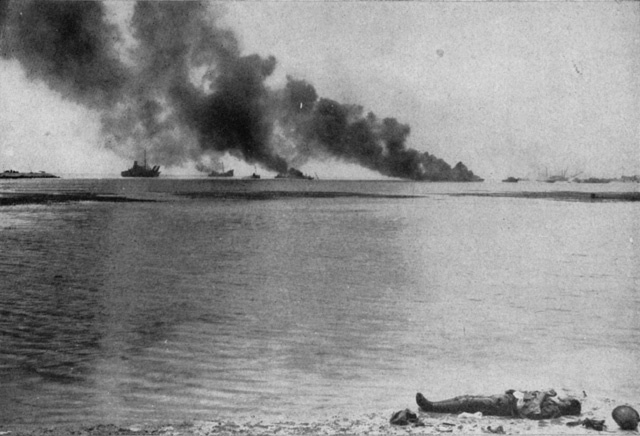 Dead Japanese soldier had no opportunity to reach the ships. Farther out on the end of the 2d Division's swinging-gate movement was the 8th Marine Regiment. Just before launching the day's attack, the 1st Battalion again became the unfortunate recipient of friendly artillery shells. Compared to the 51 lost for the same reason on the previous day, however, the five casualties of 3 July seemed light. Although this blunder delayed the unit's attack for 45 minutes and had the effect of making the personnel more "gun-shy" of their own artillery86 than the enemy's, the battalion quickly caught up with units on its flanks and enjoyed a rapid advance against virtually no resistance. TANAPAG HARBOR on 4 July had fireworks to spare as Japanese vessels burned in the harbor. The boat basin was seized shortly before, and the seaplane base shortly after, this picture was taken. regiment while neutralizing this strong point, the battalion commander (Major Chamberlin) ordered his unit to skirt to the left of the hill, leaving Company F to contain and destroy it. Once past this sore spot, the battalion moved rapidly forward, maintaining contact with units on both flanks. Company F whittled and chipped at the limestone hill throughout the day and tightened the noose about it, but Japanese hidden in the nooks and crannies continued to pop up with telling bursts whenever the Marines ventured too close. At dark of 3 July the 2d Company of the Provisional Battalion arrived to relieve Company F of its task. The latter rejoined the 2d Battalion, by then over 1,000 yards ahead. Independence Day was nothing more than a large scale mop-up, or a "rabbit hunt," as one Marine put it. 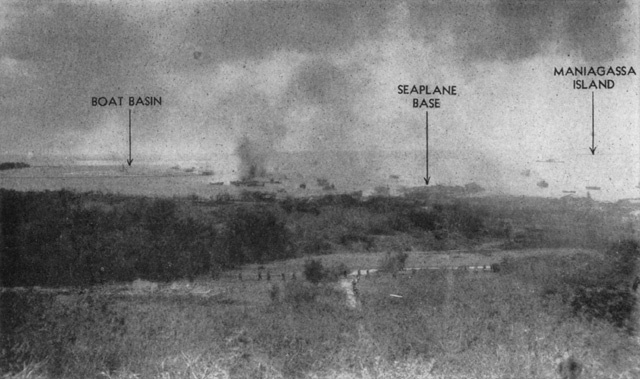 Men of the 8th Marines moved rapidly, down the hills to the Tanapag flats, beating the bush as they went, and by early afternoon reached the coast line in the vicinity of the seaplane base (see Map 20). There they ranged through the buildings and bomb shelters in search of strays but found very few. Like Garapan, the seaplane base was a weird scene of destruction and desolation. Grotesque and deformed girders stood as mute testimony of the effectiveness of U. S. naval and air bombardment. Several charred planes lay scattered in the ramp area as a reminder that this had, indeed, once been an important installation at Saipan. After weeks of trudging through the roughest terrain that the island could offer, the 8th Marines received good news on the afternoon of the 4th; the regiment would move to a bivouac-rest area. Under different circumstances, word of setting up a camp area anywhere on the fly-infested island may not have been exciting, but the conditions and situation being what they were, the word was as welcome as a reprieve to a condemned man. The rest area was located 2,000-odd yards inland from Beach Red 3, requiring a march of several miles. But no one complained. 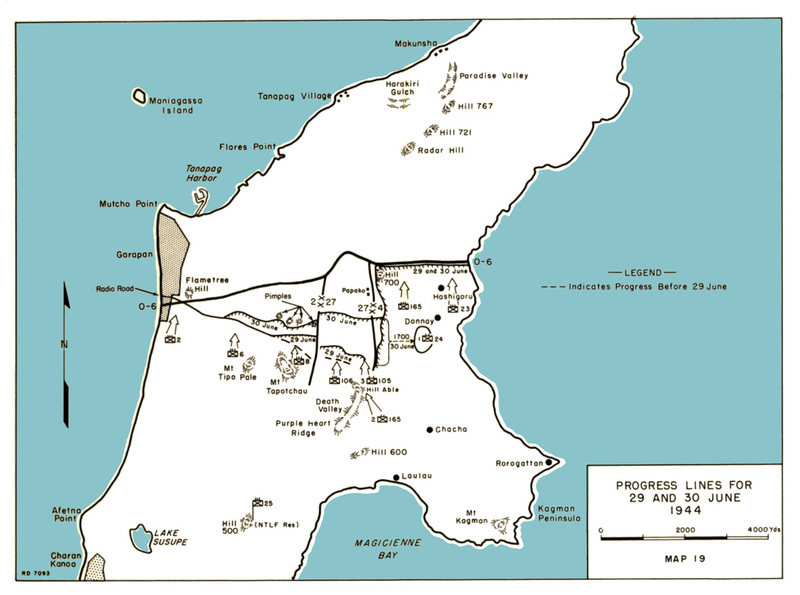 The cross-island turn of the 27th Division on 3 and 4 July carried it to the Flores Point region on Saipan's west coast and objective O-7 (see Map 20). The point itself lay within the zone of the 105th Infantry, while the other two infantry regiments would strike the beach on either side of it--the 106th to the south, the 165th to the north. With its formation unchanged (1st and 2d Battalions abreast), the 106th Infantry swept rapidly through its zone. Here, as elsewhere along the corps' entire front, the Japanese withdrawal had allowed a swift advance. All U. S. units capitalized on the situation. A few Japanese delaying groups remained behind to slow the U. S. drive, but most of these were quickly destroyed. The 106th Infantry's left battalion (1st) met an unusually persistent delaying detachment on the morning of 3 July. This enemy group focused heavy machine-gun fire into the soldiers as they moved into the attack. Positioned as it was, near the boundary between the 106th Infantry and the 8th Marines, the enemy pocket was ideally situated to cause real trouble. But not for long, for the tank-infantry combination immediately went to work. The pattern was simple, yet effective. Tanks, each sheltering a cluster of infantrymen, advanced on the enemy position, blasting a path en route. Once the tanks had approached as close to the installation as terrain would permit, the surrounding infantrymen assumed the starring role and rushed the position. Even if the tanks completed the mission without infantry assault being necessary, the latter's presence served to discourage individual Japanese from attempting to place magnetic mines against the tanks. The combination worked to the advantage of both. The 106th Infantry's reserve (3d Battalion) spent the two days in mopping up rear areas as the assault units lunged forward. The 1st Battalion, 105th Infantry, was the connecting link between the two flank regiments. On the evening of 2 July when the 3d Battalion had found itself embroiled in a fire fight with a well-entrenched enemy in the vicinity of Papako, the 1st Battalion had bypassed the strong point and tied in with the faster moving flank units. On 3 July the latter maintained a steady advance against negligible opposition, while the 3d Battalion completed its task of eliminating the stumbling block. The 165th Infantry, ready to move out at 0800, 3 July, discovered that the 4th Marine Division was directing an air strike and that any forward movement might be dangerous. The 4th Division, meanwhile, thought that the 165th was holding up awaiting units farther to the left. At 1100, however, following this faltering start, the 165th and the 4th Division got their signals straight and launched the attack. With its battalions in column, 3d leading, the 165th Infantry moved forward steadily on 3 July, gaining about 500 yards. Enemy mortar and machine-gun fire, issuing mainly from the left front, plagued the soldiers throughout the day but failed to accomplish more than slowing their rate of advance. During the night of 3-4 July the 165th Infantry command post became the scene of violent activity when 27 Japanese advanced into the installation, apparently by mistake. All of the Japanese intruders were killed with no loss to personnel of the 165th. In the morning, when an identification could be made, Colonel Ogawa, commander of the Japanese 136th Infantry, was discovered among the dead. Piecing the story together, it appears that Ogawa and his headquarters group had been by-passed by U. S. advance and that he was attempting to displace to the northeast when he blundered into the 165th's command post. Many papers and documents found on the Japanese commander were sent to higher echelons for processing, translation and interpretation. One of these, a Japanese field order, contained detailed instructions relative to the establishment of new defensive areas to the north. On the morning of the 4th, Lieutenant Colonel Joseph T. Hart, who had relieved the wounded Colonel Kelley as the 165th's commander on 28 June, ordered the 1st Battalion to pass through the 3d and continue toward the west coast. This shift was accomplished without difficulty, and at 0730 the attack was launched. Progress was favorable against virtually no opposition until the unit reached the high ground overlooking Flores Point. Here slower movement of the 105th demanded a short wait. But when the latter came abreast, the attack regained its momentum and, during the early afternoon, carried rapidly towards the coast. 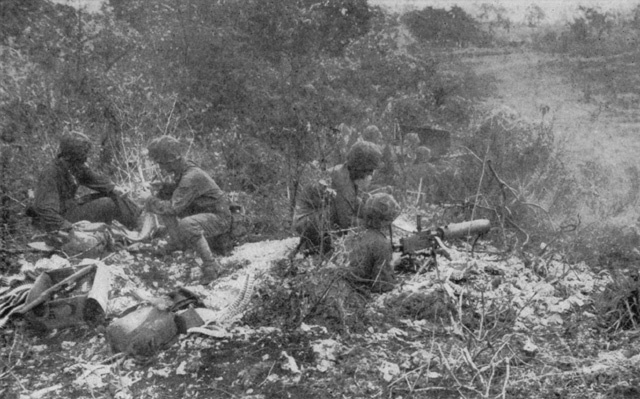 Nearing the coastal flats, the regiment met the heaviest Japanese automatic weapons fire experienced during the day. While attempting to locate and neutralize the source of this resistance, the 165th received a division order changing its boundaries and swinging the direction of attack to the northeast. (Considerations which dictated the change of zones will be discussed later in this chapter.) The new zone of action included the area occupied by the two left battalions of the 4th Marine Division, so that a relief of these was indicated. As part of the same move, the 2d Battalion, 165th Infantry, in NTLF reserve since 1 July, returned to parent control. Lieutenant Colonel Hart, therefore, ordered his 2d and 3d Battalions to relieve the Marines in the new zone. Usually, to front line troops, one hill was like any other hill, even though one might be tall, another squatty, another wooded, another bare. It was only when a hill presented something distinctly unique in the way of appearance or--especially--enemy resistance that its name became familiar to all. In this connection witness the rash of "Bloody Nose" hills and ridges which dotted the islands of the Pacific. Lying within the zone of the 4th Marine Division were four hills which became all too familiar during 3 and 4 July. Two of these were named for their heights in feet: 721 and 776; a third, nothing more than a nose protruding from the southeastern face of Hill 721, was appropriately designated "4th of July Hill;" the fourth, Radar Hill, was so named because of Japanese radar installations there. (See Map 20.) While every Marine in the division was not compelled to scale each of these, it is safe to say that everyone got into the act. As noted previously the 4th Division had not jumped off promptly on the morning of 3 July because it thought that the 165th Infantry was waiting for other elements to the rear. The 25th Marines were released to parent control on 3 July with the proviso that the 2d Battalion could not be committed without approval of the landing force commander. With this extra strength the 4th Division started its advance at 1100. The formation was unusual: three regiments abreast and each in column of battalions. The reason for this was that the division was cutting across the island so that each stride uncovered additional yardage on the right flank. It was conceivable that the right regiment would soon be entirely committed in facing the ever-widening north flank. This method, General Schmidt considered, would require less coordination and would be simpler of execution than to detail a reserve regiment for the job. The 23d Marines, already on the division right, would peel off flank protection as the lines advanced. The three assault battalions (from right to left: 3/23, 3/25 and 1/24) moved over the rugged terrain without difficulty for the first few hours; but at 1615 when the right battalion ventured toward the lower slopes of "4th of July Hill" and Hill 721, it encountered a sudden deluge of rifle, machine-gun and mortar fire. What had appeared as a series of contours on the map and as a pair of innocuous rises on the ground suddenly attained an ominous significance. Best estimates placed the enemy strength at about one battalion, with personnel nestled into every recess, cavity, cleft and cave. Hill 721 was reasonably open, while "4th of July Hill" was heavily wooded; both were well-notched with hiding places. The 3d Battalion, 23d Marines, made several attempts to capture the position, both by frontal assault and by envelopment. All efforts were repulsed. Neither tanks, so valuable in this type of fighting, nor 75mm half-tracks could move closer than 1,000 yards to the hills because all approaches were heavily mined. The assault battalions of the other two regiments, meanwhile, were unable to progress past the hills without placing themselves at the mercy of Japanese located there. Progress of the entire division, then, revolved about the seizure of Hill 721 and its wooded appendage. vulnerable location approximately 150 yards forward of the front lines. Fortunately, no serious situations developed. The other two battalions of the 23d Marines, meanwhile, were employed in protecting the north flank which now extended from the east coast about 2,500 yards inland. It was probably at this time, as plans were being made for continuation of the struggle the next day, that the apt name "4th of July Hill" was first applied. As the 25th Marines dug in for the night, a single battalion (the 3d) occupied the front lines, while the 1st was in reserve. Contact difficulties soon demanded the services of two companies of the 1st Battalion, however; Company B went into the lines on the right and Company C on the left of the 3d Battalion. The 2d Battalion, which had been in NTLF reserve in rear of the 2d Marine Division, started the long, tiresome march to rejoin its parent unit. After its arrival (about midnight, 3 July) the battalion was designated as division reserve. Men of Colonel Hart's 24th Marines established themselves on Radar Hill (1,000 yards southwest of Hill 721) for the night after shifting the 1st Battalion into reserve and moving the 2d and 3d Battalions into the lines. Two command shifts were effected by the 24th Marines during the period 3-4 July. Lieutenant Colonel Vandegrift, evacuated on 29 June, returned to the 3d Battalion on 3 July and relieved Lieutenant Colonel Lessing. The following day, Lessing got a new job: command of the 1st Battalion. Lieutenant Colonel Brunelli, who had functioned as 1st Battalion commander since 18 June, then reverted to his regular assignment as regimental executive officer. Throughout the night of 3-4 July the 14th Marines poured volley after volley into "4th of July Hill" but otherwise the night was quiet. Preliminary to the general advance of 4 July the 4th Division ordered the 23d Marines to conduct a local attack to secure the troublesome heights. This move was to be preceded by a 30-minute artillery softening. Though good on paper, the plan was thwarted in so far as the artillery was concerned. As soon as fires began, a blizzard of "cease fire" green star clusters appeared over the 25th Marines, and telephones and radios buzzed with the word that artillery was falling on friendly troops.92 Another attempt was made and again the 4th of July sky was filled with skyrocket protestations. Since the artillery preparation had been such a disappointment, and since it was felt that softening was still necessary, a rocket barrage was requested and effectively delivered on "4th of July Hill." Following this the 1st Battalion passed through the 3d and moved up the slopes. Against light machine-gun and some mortar fire, the unit swept to the top of the first hill and from there continued to the top of Hill 721. The contrast in opposition to that of the previous day indicated that the bulk of the defenders had withdrawn. This substantial advance had been achieved prior to noon, so that sufficient daylight remained for the attack to continue. Hill 767, approximately 700 yards to the northeast, would be next. But here the tactics would be different: while the main force remained at Hill 721, a strong combat patrol from the 1st Battalion would move to the objective and investigate. Enjoying greater success than anyone dared to hope, the patrol (led by Captain William C. Eisenhardt) found Hill 767 unoccupied and immediately took possession. To make certain that the enemy did not reoccupy the hill, Colonel Jones ordered the 2d Battalion to move out and set up a defense there. Getting into position was not altogether painless, however: the unit was harassed by enemy small arms firing from a palm grove to the northeast. But the retaliatory rounds of the 81mm mortar platoon apparently had good effect and enemy firing slackened. By nightfall it was necessary to bend the battalion's right flank back in order to contact units of the 1st Battalion. HILL 767 LOOMS in distance as men of the 27th Division watch United States tanks move along a ridge into firing positions. Hill 767 was seized by the 4th Division on 4 July. Japanese 20mm dual-purpose automatic cannon was apparently abandoned during enemy withdrawal. area, the battalion moved out and occupied the dominating terrain just short of Objective O-7Z (see Map 20). By darkness the 23d Marines were solidly tied in across their front: 3d Battalion extending from the east coast inland about 1,000 yards; 2d Battalion on Hill 767; and the 1st Battalion in the center connecting the two. While the 23d struggled for the hills, the other two regiments had kept pace. Nor had the going all been smooth. The 1st Battalion, 25th Marines, passed through the depleted 3d Battalion93 and continued the attack. Though Hill 721 had not been seized at the time of the unit's jump off, Lieutenant Colonel Mustain, the battalion commander, received permission to move out. By 1130, when it had pushed about 600 yards west of Hill 721, the direction of attack was changed. The battalion would execute a right turn and strike Hill 767 from the southwest. (This order was issued prior to the 23d Marines' successful combat patrol). was a difficult one. Between Hill 721 and 776 the ground sloped stair-step fashion toward the western coastal plain in a series of cliffs and plateaus. It was necessary, therefore, for the Marines to move along these plateaus in their attack toward Hill 776. Shortly after changing direction, the left of the unit met a fusillade of enemy rifle and machine-gun fire. In an endeavor to knock out this resistance, Mustain ordered the attached tanks to overrun the Japanese troublemakers. Here, however, there was a complete miscarriage of plans. The tanks became lost and wandered 700 yards to the unit's left front. The imbroglio became complete when two of the tanks were knocked out by "something"--the crews could not determine whether it was mines, mortar or artillery fire. One platoon from Company A moved against heavy opposition to the disabled tanks, where the crewmen were besieged by Japanese soldiers eager to toss grenades in upon them. It was necessary to abandon the tanks, but the personnel returned safely. Meanwhile, the battalion had broken through the resistance that had occasioned the original employment of the tanks and continued on to Hill 767. There the unit dug in for the night in contact with the 23d Marines. The 3d Battalion, 25th which had followed in reserve during the day, moved into the lines on the left, placing it along the top of the cliffs, overlooking the village of Makunsha. The 165th Infantry, after relieving most of the 24th Marines during the afternoon, moved up on the left flank and coordinated defenses with the Marines. On the division left, the 24th Marines kept pace with the flank units as the advance swung toward the sea. Machine-gun fire which issued from the right front slowed the advance of the right battalion (3d), but with the assistance of tanks the unit forged ahead. Marines of the left battalion (2d) had an enjoyable day sniping at retreating Japanese soldiers on the coastal flats below. Late in the afternoon when NTLF changed the direction of attack to the northeast, 27th Division units relieved the 2d Battalion and began the relief of the 3d. The latter, since it had one company (G) of the 2d Battalion attached, was four companies strong at this time. As the 3d Battalion halted awaiting relief by the 165th Infantry, the formation from left to right was: K, L and I with Company G in reserve behind Company I. By 1600, Companies I and G had been relieved, K and L had not. The latter two units remained in their positions throughout the night, right flank in contact with the 165th Infantry, left exposed. No trouble developed, however. The two Marine companies were finally relieved the following morning (5 July) and returned to their battalion. The Commanding General takes pride on this INDEPENDENCE DAY in sending his best wishes to the fighting men on Saipan. Your unflagging gallantry and devotion to duty have been worthy of the highest praise of our country. It is fitting that on this 4th of July you should be extremely proud of your achievements. Your fight is no less important than that waged by our forefathers who gave us the liberty and freedom we have long enjoyed. Your deeds to maintain these principles will not be forgotten. To all hands a sincere well done. My confidence in your ability is unbounded. Most of what the U. S. Navy did at Saipan was so closely-related to ground actions that to separate the functions would be to present a false picture. With gunfire and aircraft the Navy assisted the ground troops directly and daily. Elsewhere, the constant pressure of naval power was more apparent to the Japanese than to the Americans ashore at Saipan. On 27 June Mine Sweeping Squadron Four swept Magicienne Bay, clearing about 25 square miles in the process. On 28 June net cargo ship (AKN) Keokuk laid 10,000 feet of antisubmarine net off the entrance to Garapan anchorage as a positive barrier to Japanese underwater venturers. On the evening of 2 July the destroyer Melvin spotted two Japanese landing craft moving from Marpo Point on Tinian. Without waiting to determine their destination, the Melvin sank one and drove the other aground. Having secured the NTLF sea flanks in the Battle of the Philippine Sea, the Navy continued to protect those flanks against amphibious infiltration. The U. S. Navy's covering operations effectively isolated Saipan from outside Japanese interference. 1. The general's information was a day late. 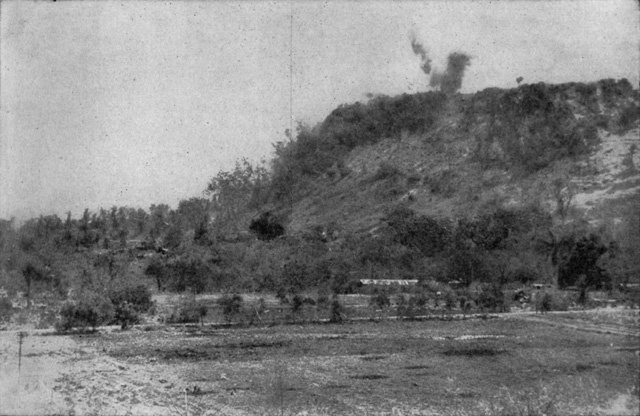 The 1st Battalion, 29th Marines, reached Tapotchau's summit on 25 June. 2. Marines named this hill "Radar Hill." 3. CINCPAC-CINCPOA Item #9983-85, 24-25. 4. NTLF Operation Order 14-44. 5. 23d Mar Report, 14. 2d Bn, 23d Mar Report, 4. 7. 4th Mar Div Report, Section VI, 27-28. 24th Mar Report, 21. Ltr from Maj A. B. Hanson to CMC, 14Feb50. 10. 106 Inf Report, 9-11. 11. 27th Inf Div Periodic Report No. 11, 27Jun44. 12. 8th Mar Report, 6-7. 13. 6th Mar Report, 9-10. 14. 2d Mar Report, 5. 15. "Concertina" is a single strand of barbed wire wound into a loose doughnut shape. When it is desired to put it to use, the two loose ends are pulled in opposite directions, stretching the barbed wire into a long cylindrical obstacle. A concertina can be laid in a fraction of the time that it takes to prepare a double apron fence. 17. 2d Mar Div Report, Section VI, 16. 18. Memo for Gen Richardson from Col G. M. O'Connell, 12Jul44. O'Connell Letter. 19. TF 51 Report, Encl A and Annex 1 to Encl A. 20. 2d Mar Report, 5. 21. Major Brousseau had taken command of the battalion on 25 June when Lieutenant Colonel John F. McDonough had been wounded. Replacing Brousseau temporarily was Captain James A. Dooley, USA, who commanded until Major Dennis D. Claire, USA, (transferred from the 3d Battalion) arrived to take over. With Major Claire's departure from the 3d Battalion, Major Martin H. Floery, USA, assumed command of that unit. 22. 23d Mar Report, 44. 23. The "east side of hill 343" was the cliff line which had troubled the 106th Infantry for so many days. The hill itself was about 1,200 yards south of Mt. Tapotchau. 24. Hill 268, about one mile southeast of Tapotchau's peak, lay within the zone of the 165th Infantry. This hill constituted the southern end of Purple Heart Ridge. 25. The "Chacha water area," not identified on U. S. maps, was a large fresh water spring on the high ground (part of Purple Heart Ridge) west of Chacha Village. The "water area" was near the 27th Division's right boundary. 26. CINCPAC-CINCPOA Item #9983-85, 25. 27. 2d Mar Div Report, Section VI, 17. 28. Ltr from Commander Fifth Fleet to Commander Amphibious Forces, Pacific Fleet, 29Jul44. 29. 6th Mar Report, 10. Fisher Interview. 30. These nicknames were for Major William C. Chamberlin (Bill), Lieutenant Colonel Rathvon M. Tompkins (Tommy), Major Stanley B. Larson (Stan), and Lieutenant Colonel Lawrence C. Hays, Jr. (Larry). 31. 8th Mar Report, 7. 32. CINCPAC-CINCPOA Item #9983-85, 26. 33. It will be recalled that Colonel Stebbins, the regularly assigned chief of staff, had taken over command of the 106th Infantry on 26 June. Certificate of MajGen G. W. Griner, 12Jul44. 34. 106th Inf Report, 12-13. 36. The unit was still referred to as the 3d Battalion, however. 37. 106th Inf Report, 12-13. 27th Inf Div Field Order #52. 38. 27th Inf Div Periodic Report No. 12, 28Jun44. 39. NTLF Operation Order 15-44. 40. 4th Mar Div Report, Section VI, 28. 23d Mar Report, 44. 41. 165th Inf Report, 6. 42. Both Japanese quotes from CINCPAC-CINCPOA Item #9983-85, 26. 44. 2d Mar Div Report, Section VI, 18. 45. NTLF G-2 Report, 39. 46. TF 51 Report, Encl A, 10-11. NTLF G-2 Report, 39. 47. CINCPAC-CINCPOA Item #9983-85, 27. 48. 23d Mar Report, 44-45. 49. 165th Inf Report, 6. 50. 24th Mar Report, 22. 51. 25th Mar Report, 7. 52. 106th Inf Report, 14-16. 27th Div Periodic Reports 13 and 14. 53. 27th Div Periodic Reports No. 13 and 14. Field Message 2 from MajGen Griner 29Jun44. 54. 2d Mar Report, Encl C. Throneson. 55. 2d Mar Div Report, Section VI, 19. Ltr from Capt C. Schultz, Jr., to CMC, 16Jan50. 56. The forecast: Cloudy; probable showers of grenades; scattered Japanese. 57. 2d Mar Div Report, Section VI, 18-19. 6th Mar Report, 11. 58. Some conclusions on the reasons for these accidents will be found on page 250, Chapter VII. 59. 8th Mar Report, 7-8. Tompkins. Chamberlin. 60. 2d Mar Div Report, Section VI, 19-20. 61. TF 51 Report, Encl A, Annex 1. 62. Men of the 165th Infantry later called it "Valley of Hell." 63. NTLF G-2 Report, 42. 64. The 2d Battalion, 2d Marines, had done little fighting with its parent regiment. Attached to the 6th Marines on 15 June, it returned to the 2d Marines on 23 June and remained until attachment to the 8th Marines on 1 July. 65. Now commanded by Major Harold K. Throneson who took over the 3d Battalion after Lieutenant Colonel Johnston had been wounded for the second time on 21 June. Throneson achieved the distinction of occupying the most unusual observation post during the operation when he bridged with a plank the top corner of a shell-battered, roofless building in Garapan, climbed into his crow's nest with his radio operator, and carried on business as usual. 66. 2d Mar Report, 5-6. Throneson. Brooks. Kyle. 67. 2d Mar Div Report, Section VI, 20-22. 6th Mar Report, 11-12. 68. Credit for suggesting and supervising this scheme of evacuation goes to Pharmacists Mate 1st Class Frank M. Campbell, USN. On this and many other occasions, Campbell established himself as one of the bravest men to wear a uniform. 69. 8th Mar Report, 8-9. 1st Bn, 8th Mar Report, 9. Gunter. Chamberlin. 70. 27th Div G-3 Periodic Reports Nos. 15 and 16. 106th Inf Report, 16-18. 27th Div Field Message 3, 30Jun44. 27th Div Field Order 53. 71. 105th Inf Report, 8. 72. 165th Inf Report, 6-7. 73. This disposition represented an exchange of jobs by the 1st and 2d Battalions 24th Marines. 74. 4th Mar Div Report, Section VI, 30-31. 32d Mar Report, [sic: 23d Mar?] 45. 24th Mar Report, 22-23. 1st Bn, 24th Mar Report, 9. 75. Utilization Of The Artillery In The Attack, 1Jul44, BrigGen A. M. Harper, USA. 76. 2d 155mm Howitzer Battalion, V Amphibious Corps Report, 3. 78. NTLF G-2 Report, 45-48. 79. TF 51 Report, Encl A and Annex 1 to Encl A. 80. As noted previously, Hill 221 was named "Radar Hill" by Marines; Hill 112 appeared as "Tarohoho" on U. S. maps. 81. NTLF G-2 Report, 50-51. 82. These corrugated sheets served another purpose, not only at Garapan, but all over the island: U. S. soldiers and Marines placed them over their foxholes in an attempt to stay dry during the torrential rains. Such improvisation was usually frustrated because the sheets, almost without exception, were riddled with shell holes. 84. 2d Mar Report, 6. Throneson. Brooks. 85. 6th Mar Report, 13. 86. The term "own artillery" is here used to refer to all U. S. artillery at Saipan, since the unit, or units, responsible for these miscalculations was never definitely identified. 87. 8th Mar Report, 9. Wallace. 88. 27th Div Periodic Reports 18 and 19. 106th Inf Report, 18-20. 89. 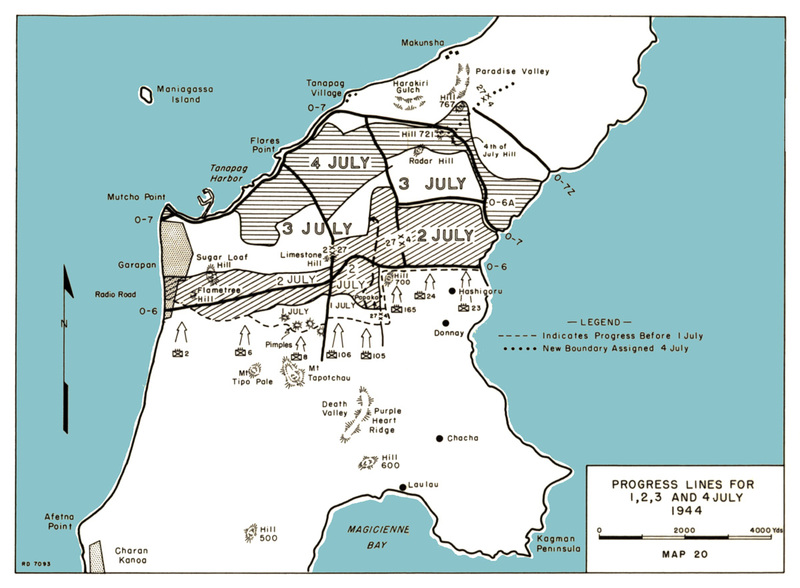 There was apparently some confusion as to the exact status of the battalion on 3 and 4 July. The 105th Infantry believed it to be under regimental control at 1300, 3 July and at 0940, 4 July ordered the unit to "comb area in Regtl zone. . . ." This is contradicted by 27th Division Field Message 5 issued at 1800, 3 July: "2d Bn, 105th Infantry, Division Reserve, will remain in present position." And in 27th Division G-3 Periodic Report for 1600, 3 July to 1600, 4 July, mention is made that the battalion had remained "in Div Res at TA 213." Later, 27th Division Field Order 54, issued at 2200, 4 July, formally returned the 2d Battalion to the 105th Infantry. 90. 27th Div Periodic Reports 18 and 19. 105th Inf Report, 8-9. 91. 165th Inf Report, 7-8. 27th Div G-3 Reports 17, 18 and 19. 92. The 23d Marines Action Report blamed this situation on the fact that the 25th Marines had "erroneously reported its position." 93. The 3d Battalion was reorganized on a two company basis at this time. Company L, which had no officers left, was dissolved and its personnel assigned to the other two rifle companies. This move placed three officers and 151 men in Company I and three officers and 164 men in Company K.
94. The foregoing is a synthesis of the following sources: 4th Mar Div Report, Section VI, 31-32; 23d Mar Report, 45-47; 24th Mar Report, 23; 25th Mar Report, 7-8; 2d Bn, 23d Mar Report, 5; 3d Bn, 23d Mar Report, 7; 2d Bn, 24th Mar Report, 9-10; 3d Bn, 24th Mar Report, 9-10; 1st Bn, 25th Mar Report, 16-19; 3d Bn, 25th Mar Report, 12; Treitel; L. R. Jones. 95. NTLF Operation Order 22-44. 96. TF 51 Report, 10-13. 97. Navy's Air War, 214.